Carolyn and I met whilst studying at Newcastle University. After qualifying in 2003 we both worked in general practice in the North East of England before moving to Yorkshire. We purchased Market Weighton Dental Practice (formerly Highgate Dental Practice) in 2007 from Steven Monk when he retired. 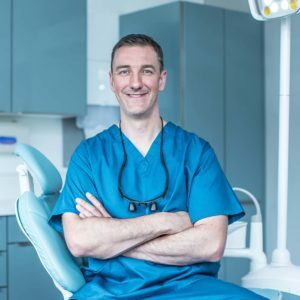 I take a real pride in my work and I particularly enjoy cosmetic dentistry; the instant results I can achieve using modern, minimally-invasive techniques such as direct composite bonding. This allows me to transform someone’s smile in just a couple of hours. I’m really enjoying using our latest dental gadget – the 3D intra oral scanner, often allowing me to avoid using traditional dental moulds for crown and bridge work. The accuracy of the scan is amazing and we can have the laboratory work back in as little as 3 days. During 2019 I’m attending the prestigious Nigel Hargreaves Restorative Course at the Academy of Clinical Excellence to further enhance my restorative skills. Outside of dentistry I enjoy cars, gadgets, keeping fit and spending time with our daughter Olivia.